The American middle class is shrinking at the national level, as was documented in a previous study by Pew Research Center. Our new analysis of government data finds that the middle class is also losing ground in the vast majority of metropolitan areas in the country. 1 The decline in the share of adults who are middle class nationally also proved to be a pervasive local phenomenon in the period from 2000 to 2014. Affecting communities from Boston to Seattle and from Dallas to Milwaukee, the share of adults living in middle-income households fell in 203 out of 229 U.S. metropolitan areas examined from 2000 to 2014. With fewer Americans in the middle-income tier, the economic tiers above and below have grown in significance over time. The share of adults in the lower-income tier rose in 160 areas, and the share in the upper-income tier increased in 172 areas. These trends were not mutually exclusive – the shares of adults in the lower- and upper-income tiers both increased in 108 metropolitan areas. 2 The share of adults in the upper-income tier increased more than the lower-income share in about half the metropolitan areas analyzed. Across the 229 areas, adults were more likely to climb the income ladder than to descend it in 119 areas. The areas that experienced the biggest gains in economic status from 2000 to 2014 are a diverse group, including energy-based economies such as Midland, Texas; the tourism-driven locality of Barnstable Town, Massachusetts; and the meat-packing area of Amarillo, Texas. But the lower-income share increased more in 110 areas. The areas that slipped the most in economic status include Goldsboro, North Carolina, and Springfield, Ohio. Many of these areas are more reliant than average on manufacturing, but other factors likely played a role as well. 4Households in all economic tiers experienced near-universal decreases in median incomes across U.S. metropolitan areas. Middle-income households lost ground financially in 222 of 229 metropolitan areas from 1999 to 2014. Meanwhile, those in the lower-income tier saw their median income slip in 221 areas and those in the upper-income households took a financial hit in 215 areas. 5The 10 metropolitan areas with the greatest shares of middle-income adults are located mostly in the Midwest. Wausau, Wisconsin, led on this basis, with 67% of adults living in middle-income households in 2014. It was followed closely by Janesville-Beloit, Wisconsin (65%). On the other end of the scale across all 229 areas examined was Monroe, Louisiana, where the share of adults who were middle income stood at 42%. 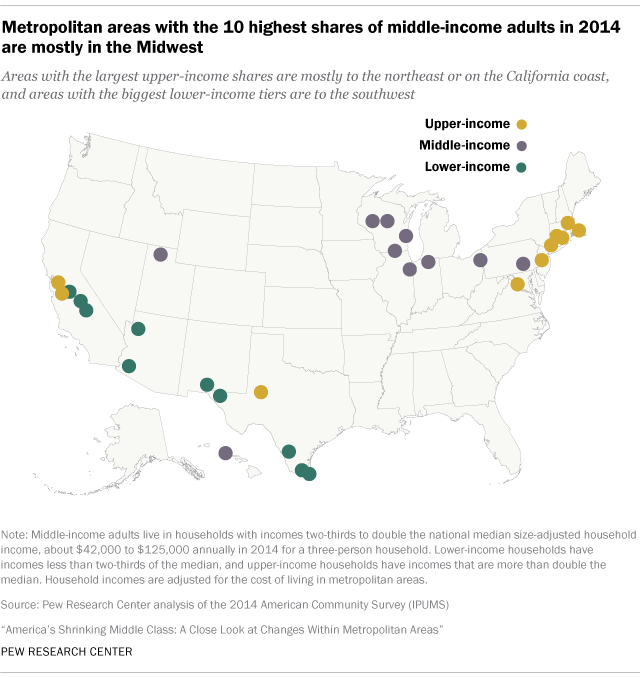 Middle-income adults lacked a majority in 50 metropolitan areas in 2014. Metropolitan areas with the largest upper-income shares are mostly to the northeast or on the California coast, while the 10 metropolitan areas with the biggest lower-income tiers are to the southwest, several on the border with Mexico. 6There is notable variation in the median income of middle-class households across U.S. metropolitan areas. The median income of middle-class households was within the $70,000 to $75,000 range in 138 out of 229 areas, but it was as high as $81,283 in Racine, Wisconsin, and as low as $64,549 in Hanford-Corcoran, California. By definition, middle-class households earned from about $42,000 to $125,000, but within this range, households in an area might cluster near the top or the bottom end. The 229 metropolitan areas we examined, out of a total of 381 currently defined by the federal government, are the ones that are identifiable in publicly available Census Bureau datasets and for which data were available for both 2000 and 2014. They accounted for 76% of the nation’s population in 2014. We define middle-income households as those whose annual household income is two-thirds to double the national median after incomes have been adjusted for household size. In 2014, this amounted to about $42,000 to $125,000 annually for a household of three. Lower-income households have incomes less than two-thirds of the median and upper-income households have incomes that are more than double the median. Incomes in each metropolitan area are adjusted for the cost of living in the area relative to the national average cost of living.